Frank Marino sat in a repurposed U.S. Coast Guard boat bobbing in Boston Harbor one morning late last month. He pointed the boat straight at a buoy several hundred yards away, while his colleague Mohamed Saad Ibn Seddik used a laptop to set the vehicle on a course that would run right into it. Then Ibn Seddik flipped the boat into autonomous driving mode. They sat back as the vessel moved at a modest speed of six knots, smoothly veering right to avoid the buoy, and then returned to its course. In a slightly apologetic tone, Marino acknowledged the experience wasn’t as harrowing as barreling down a highway in an SUV that no one is steering. “It’s not like a self-driving car, where the wheel turns on its own,” he said. Ibn Seddik tapped in directions to get the boat moving back the other way at twice the speed. This time, the vessel kicked up a wake, and the turn felt sharper, even as it gave the buoy the same wide berth as it had before. As far as thrills go, it’d have to do. Ibn Seddik said going any faster would make everyone on board nauseous. The two men work for Sea Machines Robotics Inc., a three-year old company developing computer systems for work boats that can make them either remote-controllable or completely autonomous. In May, the company spent $90,000 to buy the Coast Guard hand-me-down at a government auction. Employees ripped out one of the four seats in the cabin to make room for a metal-encased computer they call a “first-generation autonomy cabinet.” They painted the hull bright yellow and added the words “Unmanned Vehicle” in big, red letters. Cameras are positioned at the stern and bow, and a dome-like radar system and a digital GPS unit relay additional information about the vehicle’s surroundings. The company named its new vessel Steadfast. Autonomous maritime vehicles haven’t drawn as much the attention as self-driving cars, but they’re hitting the waters with increased regularity. Huge shipping interests, such as Rolls-Royce Holdings Plc, Tokyo-based fertilizer producer Nippon Yusen K.K. and BHP Billiton Ltd., the world’s largest mining company, have all recently announced plans to use driverless ships for large-scale ocean transport. 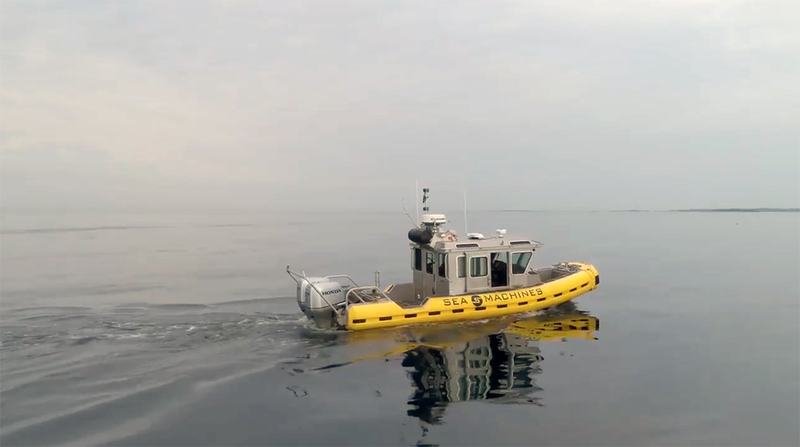 Boston has become a hub for marine technology startups focused on smaller vehicles, with a handful of companies like Sea Machines building their own autonomous systems for boats, diving drones and other robots that operate on or under the water. As Marino and Ibn Seddik were steering Steadfast back to dock, another robot boat trainer, Michael Benjamin, motored past them. Benjamin, a professor at Massachusetts Institute of Technology, is a regular presence on the local waters. His program in marine autonomy, a joint effort by the school’s mechanical engineering and computer science departments, serves as something of a ballast for Boston’s burgeoning self-driving boat scene. Benjamin helps engineers find jobs at startups and runs an open-source software project that’s crucial to many autonomous marine vehicles. He’s also a sort of maritime-technology historian. A tall, white-haired man in a baseball cap, shark t-shirt and boat shoes, Benjamin said he’s spent the last 15 years “making vehicles wet.” He has the U.S. armed forces to thank for making his autonomous work possible. The military sparked the field of marine autonomy decades ago, when it began demanding underwater robots for mine detection, Benjamin explained from a chair on MIT’s dock overlooking the Charles River. Eventually, self-driving software worked its way into all kinds of boats. These systems tended to chart a course based on a specific script, rather than sensing and responding to their environments. But a major shift came about a decade ago, when manufacturers began allowing customers to plug in their own autonomy systems, according to Benjamin. “Imagine where the PC revolution would have gone if the only one who could write software on an IBM personal computer was IBM,” he said. In 2006, Benjamin launched his open-source software project. With it, a computer is able to take over a boat’s navigation-and-control system. Anyone can write programs for it. The project is funded by the U.S. Office for Naval Research and Battelle Memorial Institute, a nonprofit. Benjamin said there are dozens of types of vehicles using the software, which is called MOOS-IvP. Teaching a boat to drive itself is easier than conditioning a car in some ways. They typically don’t have to deal with traffic, stoplights or roundabouts. But water is unique challenge. “The structure of the road, with traffic lights, bounds your problem a little bit,” said Benjamin. “The number of unique possible situations that you can bump into is enormous.” At the moment, underwater robots represent a bigger chunk of the market than boats. Sales are expected to hit $4.6 billion in 2020, more than double the amount from 2015, according to ABI Research. The biggest customer is the military. Several startups hope to change that. Michael Johnson, Sea Machines’ CEO, said the long-term potential for self-driving boats involves teams of autonomous vessels working in concert. In many harbors, multiple tugs bring in large container ships, communicating either through radio or by whistle. That could be replaced by software controlling all the boats as a single system, Johnson said. Another local startup, Autonomous Marine Systems Inc., has been sending boats about 10 miles out to sea and leaving them there for weeks at a time. AMS’s vehicles are designed to operate for long stretches, gathering data in wind farms and oil fields. One vessel is a catamaran dubbed the Datamaran, a name that first came from an employee’s typo, said AMS CEO Ravi Paintal. The company also uses Benjamin’s software platform. Paintal said AMS’s longest missions so far have been 20 days, give or take. “They say when your boat can operate for 30 days out in the ocean environment, you’ll be in the running for a commercial contract,” he said. When commercial boat captains used to spot AMS’s vehicle in the waters, they often notified the Coast Guard, thinking that someone must have fallen off. Its fiberglass sail now says “unmanned vehicle” and includes a phone number for a passersby to call with concerns. Since making that change, Paintal said he’s received two calls. One was from the Boston Fire Department, and the other was from a pleasure boater. In both cases, their question was the same: What is this thing?